Recent research is throwing new light on the health benefits of nuts. So lets look at what makes nuts healthy and how much we need to eat in order to enjoy their health benefits? True, or botanical nuts: dry, hard-shelled, uncompartmented fruit that do not split on maturity or release seeds e.g. acorns, chestnuts, hazelnuts etc. Drupes: fleshy fruit surrounding a stone, or pit, containing a seed e.g. almonds, cashew, coconut, pecans, pistachio and walnuts. Gymnosperm seeds: naked seeds, with no enclosure e.g.pinenuts. Nuts are very nutrient dense containing some protein, fat (particularly polyunsaturated fat), dietary fibre, calcium, vitamins and minerals and are naturally low in sodium. To gain the most benefit from nuts, it is important not to add salt, sugar or other fats, so unprocessed nuts are best. Raw nuts should be consumed with their skin on, as most of the antioxidants and phytochemicals are located in the soft outer shell of the nut. What are the nutritional benefits of eating nuts? Here are just a few of the results from studies showing that tree nuts (almonds, Brazil nuts, cashews, hazel nuts, macadamia, pecans, pine nuts, pistachios and walnuts) are healthy to eat. Studies have considered the role of nuts in weight control offering several reasons why the regular consumption of nuts may not result in weight gain. Nuts are filling because they are high in protein and dietary fibre. While they contain too little carbohydrate to measure their glycaemic index nuts appear to slow the digestion of carbohydrate rich foods. These factors along with their crunchy nature stimulates, during chewing, hormones like cholecystokinin which aids satiety. Nut may increase metabolism . It is now thought that nut consumption may lead to an increase in energy expenditure as the high unsaturated to saturated fat ratio in nuts may increase resting metabolic rate (RMR). Reduced energy absorption. Some research suggests that despite their high fat nature the fat found in nuts may not be highly bioaccessible. Meaning that some fat may be lost in faeces rather than being available as an energy source. Allergies can be triggered by a number of foods but the most common are peanut and tree nut. Tree nuts include: cashew, almond, Brazil, hazelnut, walnut, pecan and pistachio. Peanuts are a legume and so allergy sufferers may also need to be careful when eating legumes such as peas, beans and lentils. If you suspect you have an allergy to nuts consult your doctor who may refer you to an allergist and/or laboratory for testing. Read labels carefully, avoid all foods and products that “contain” or “may contain nuts”. Also be aware that cross contamination can occur during manufacture; retailing and food preparation when nut fragments may be transferred on equipment, utensils and during handling. For those people who are of a healthy body weight and non-allergic the use of nuts as a snack or in salads or main meal dishes should do no harm. However it is important to watch the other ingredients accompanying the nuts which may contribute to weight gain such as butter and sugar found in. e.g. muesli bars, biscuits, bliss balls, nought, cakes, confectionery and slices. 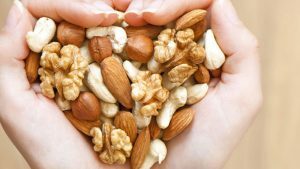 People who have very high energy needs such as athletes or workers involved in physically demanding occupations will find nuts a healthy addition to their diet (but should still note comments above). If overweight or obese then limit nuts to 30g per day e.g. 2 brazil nuts each day will confer health benefits plus help you to meet your daily needs for selenium. Discuss your needs with your Dietitian. Remember nuts alone won’t make you healthy unless taken as part of a healthy diet as outlined in the NHANES study. If you are having 3 red meat ( e.g. beef, pork or lamb), 2 white (e.g. fish or chicken) and 2 non meat meals ( e.g.vegetarian dishes such as based on egg, cheese, bean or lentils) per week then the nuts could be included in the non meat meal dishes. See our recipe for Spinach and walnut lasagna. O’Neil CE, Keast DR , Nicklas TA, Fulgoni VL, 111,2011. Nut consumption is associated with decreased health risk factors for cardiovascular disease and metabolic syndrome in U.S adults:HNANES 1999-2004. J Am Coll Nutr. 30:502-510. O’Neil CE, Keast DR, Fulgoni VL, Nicklas TA, 2010. Tree nut consumption improves nutrient intake and diet quality in US adults:an analysis of National Health and Nutritional Examination Survey (NHNES) 1999-2004. Asia PacJ CLin Nutr.19(1):142-150. 7 Walnuts a Day Deliver Health Benefits,” Health News, March 28,2011. http://www.upi.com?Health_News/2011/03/28/7-walnuts-a-day-deliver-health-benefits?UPI-93441301365744/. Is going "Gluten Free" a healthy food choice?